Iran’s Supreme Leader Ayatollah Ali Khamenei had strong words last week about Iran’s agreement with major world powers, declaring that once a final deal was reached it should result in an immediate end to all sanctions on Iran. 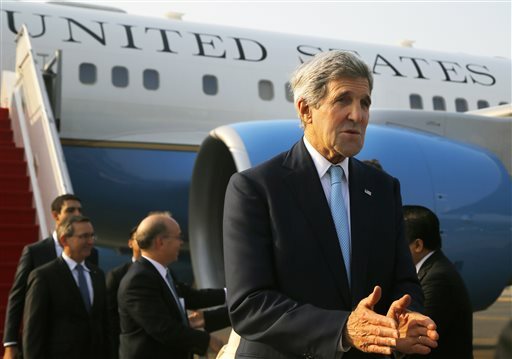 Kerry has said the sanctions would be suspended in phases. “You know, they’re going to put their spin on their point of view and obviously they’ll allege that we’re putting a spin on our point of view,” Kerry said of the Iranian comments. There were also differing U.S. and Iranian interpretations of a previous interim agreement with Iran, but Iran upheld that agreement, Kerry said. Iran and major world powers – the United States, Britain, France, Germany, Russia and China – reached a framework nuclear agreement on April 2 that would curb Iran’s nuclear program and prevent it from being able to develop a bomb, in exchange for the West lifting economic sanctions. Iran has long maintained its nuclear program is for peaceful purposes. Kerry noted that President Barack Obama on Saturday delivered a public rebuke to Republican Senator John McCain for having called Kerry “delusional” in an interview in which McCain questioned whether Kerry was being forthcoming about the deal. Kerry, who will brief Congress on the deal on Monday and Tuesday, warned lawmakers not to put in place any conditions that would impede implementation of the Iran deal. The framework is meant to be the basis of a final agreement to be reached by the end of June. Congress is poised to advance a bipartisan bill to give lawmakers the right to review any final deal and to have a vote on whether sanctions imposed by Congress should be suspended. Democratic Senator Bob Menendez, a co-author of the bill, on Sunday did not rule out that senators would change a provision that has irritated the Obama administration. It would require the administration to certify that Iran is not involved in terrorism attacks against the United States.